Norman Foster’s recently completed flagship Apple Store in Chicago, whose ultra-light roof meant designers could include plenty of unobstructed views, now seems unable to cope with the stress of a Chicago winter. Residents are reporting that the downward-sloping roof has turned the sidewalks around the store into a hazard zone, as ice and snow has been sliding off and potentially endangering pedestrians. According to 9to5mac and local blogger Matt Maldre, Apple has decided to address this problem by roping off all of the walkways around the store except for the entrance. 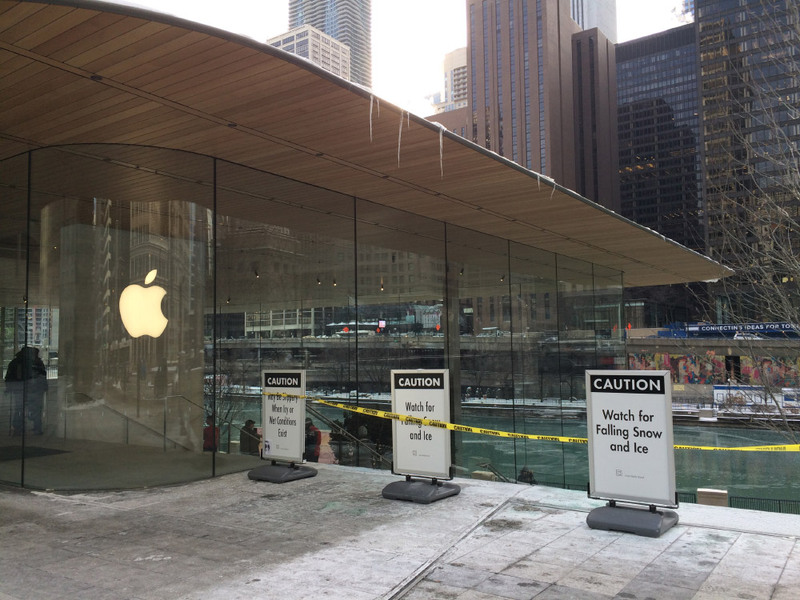 Because the store is sited on the bank of the Chicago River and meant to act as a “Town Square,” Apple’s closure also means that the riverfront will be blocked off as well. The curved, 32-foot-tall glass facade that seamlessly wraps the store hasn’t gotten out of the cold weather unscathed, either. As one Skyscraperpage forum user noticed, the outer layer of the laminated glass paneling seems to have cracked because of the weather. Since each panel is produced in layers, the entire piece will need to be replaced, and definitely not for cheap. While record-setting cold temperatures are chilling most of the country right now, Chicago winters are known to be particularly harsh. Despite the acclaimed “MacBook-shape” of the roof, it’s unknown how designers and engineers involved with the project didn’t see how it would be a problem.